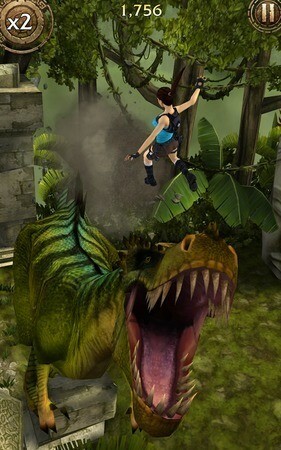 Lara Croft: Relic Run is one hell of a game! It’s tough to get through obstacles let alone find relics. Traps, big crevices, falling pillars makes running extremely difficult on treacherous terrain. My heart skips a beat every time I perform a parkour stunt or a wall run. This is one of the hardest endless runners I have ever played. There are plenty of boosts that will help Lara reach her goals faster. Of these, clue boosters, coin trails and power-ups are important. While running, you will need to collect certain clues like maps, binoculars etc to fill the clue meter. The clue meter is located at the top-left corner of the game screen. Once the clue meter fills up completely, a relic will appear randomly at any spot. You will have to collect the relic first to unlock another relic, which will again require you to collect a set of clues and fill up the clue meter. The Clue Booster power-up (two magnifying glasses icon) appears in your path. When you collect it, clues will appear frequently. Collecting them will fill up the clue meter faster. Make sure you grab every clue before the clue booster timer runs out. Upgrading Clue Booster via Store increases the timer and lets you collect bigger clues that will help fill up the clue meter much faster (almost 50 percent) than before. Wall runs and daredevil leaps across gaps are some of toughest parkour moves. Once you have mastered those two moves, running on uneven terrain won’t be too hard for you as getting past most obstacles (except traps) is easier. There’s a trick to perform big leaps when you jump through gaps. Make sure you long-swipe up starting right above Lara’s head when you are at the edge of the road. Of course, timing is important, but short swipes won’t make her perform big leaps, neither would swiping up starting from the bottom of the screen would make her jump across cracks. If you spot cracks having a big tree branch, fallen stone pillar above it, swipe left or right to perform a wall run. If Lara’s running on the middle path, you will have to swipe left or right twice to perform a wall run. If you have taken the left/right path already, you just have to swipe once soon after you come across a crevice with an object above. Coins play a crucial role in Lara Croft: Relic Run. You will need them to upgrade boosters, buy medic packs, clips, ammo cache and power-ups. Upgrading coin trails will let you collect valuable coins faster. With this booster upgraded at regular intervals, silver, gold and copper coins will appear sooner. Collect those valuable silver and gold coins to increase the coin count. Along with upgrading coin count, upgrade the coin magnet to make the power-up last longer than before. Switching to a different costume can give you bonuses like score multipliers, decreased enemy accuracy etc. Your standard costume offers some upgrade bonus if you spend coins. The first upgrade will give a score multiplier. You can purchase other outfits like the “Stealth Suit” and the “Bomber Pilot”, but for that you will need at least 150 diamonds. Collect Diamonds via Supply Drops. You may also find some of these shiny gems in your path while running. Save them for costumes and don’t use them for purchasing ankhs. Assault rifles, Dual SMGs and grenade launchers can deal more damage than shotguns or crossbows. Save coins to purchase them. You may also upgrade your standard dual pistols to increase damage rate, clip size and reload times. 1. Use resurrection ankhs only when you have collected all clues and got killed after bumping into an obstacle or falling down a rock crevice. Using them before is a waste of ankhs as well as diamonds, because you will need diamonds to refill ankhs. I would suggest saving diamonds for outfits as there are chances of getting 10 Resurrection ankhs via Supply Drops. 2. When shooting minions, keep an eye on coin crates. Shoot these crates to earn extra bonus coins. You may also find health and ammo crates. Don’t forget to hit them to earn extra HP and ammo. All In-Game Screenshots, Courtesy Square Enix. What about the wall-run with red markings? I never got that what to do there and I always fall there, around level 30 or 32. I’m on level 20 and I am stuck help anyone!